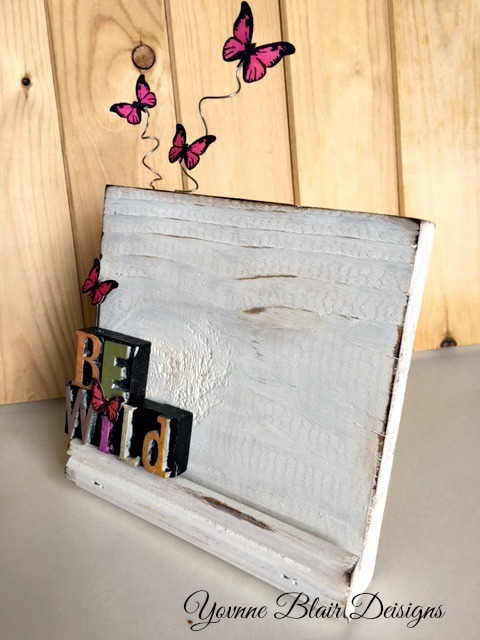 3 W's...Word, Wood and WILD project..hehehe. This one made me think...what is my interpretation of WILD??? 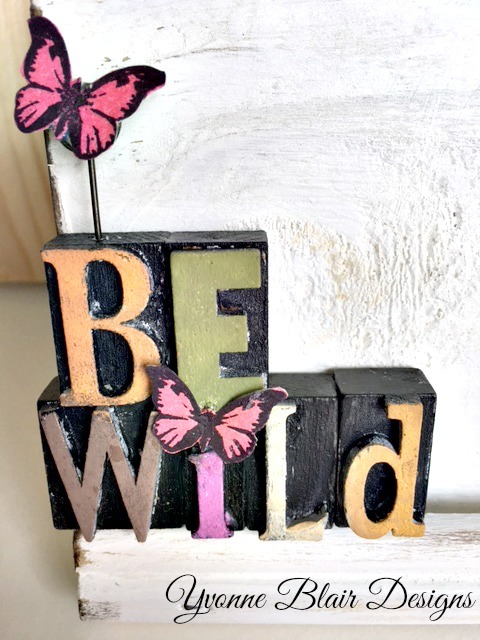 Is there only one way to channel WILD? I think not...which led me to further thought. In the sense to BE free...BE WILD...Be comfortable with the woman you are! I wanted to create something that I could change a bit out at times. My hubby had built me these easels to use for retreats projects and I had a few left over. How perfect is that since it is one of the requirements...WOOD. I sanded it down and distressed it with Gathered Twigs Distress Ink. I pulled out a few things to work with. I always do that. constantly having to dig through and find things. The first thing I pulled out beside the easel was Tim's Printer's blocks. I love them...honestly I'm hoarding them and I'm not sure why. If they aren't used they aren't loved, right! I painted them black and then painted on different colors for each letter. Glued them all together using Glossy Accents and attached the to the molding part of the easel. I left some room behind so I can slip different things on the easel when I tire of whatever is on it. my favorite Picked Raspberry Distress Ink, then fussy cut them out. some 'flying' butterflies with some wire...it gives it a 'free' aspect don't ya think? Next I created the Sentiment card. had the perfect sentiment for this project! It really is funny, but also sends a great message! I want to be one of those women! hehehe. So there you have it...a really easy peasy home decor project! I love the versatility of being able to change messages out or add pics in. It would be a great place to add a picture of a girls night out or something like that! 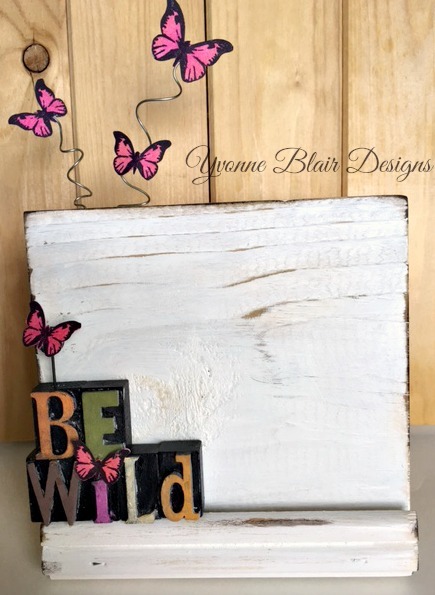 I hope my little BE WILD easel has given you some inspiration to get creative! To join in the fun at Creative Carte Blanche! It's a great place to get creative without the pressure of using certain products! Just be free and get your creative on! Thank you Jane! How sweet...hope you have fun with your hubby's creations...Hugs. Thank you Chris! It was a fun piece to work on! Thanks for stopping by! hugs. ABSOLUTELY POSITIVELY ADORE your creation Yvonne... TOTALLY FABULOUS. 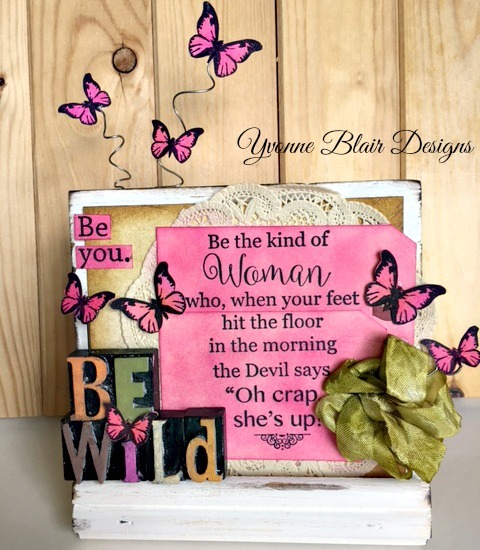 I sure hope I'm that kind of woman!!! I am thinking that FOR SURE - YOU fit the bill sweet girl. And how fun is that - you can replace the cards too. GENIUS. Seems like you did your WOOD, WORD, WILD them proud! XXj. Okay, first of all, I LOVE that stamped sentiment. It cracked me up! I was taking in all the details of your project, reading your description and got to the last photo and finally read it. Ha-ha! Love that. Your piece is fantastic and SO you with the pink and the butterflies. Love the wood blocks and how you painted them differently. And the easels your hubby made are great. Love it!!! Love you, girl! 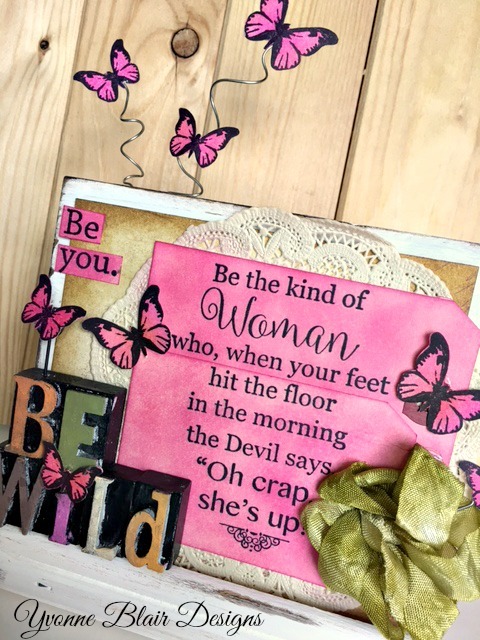 so funny, we all need to be wild!